This still life was taken on my last trip to Maine in Acadia National Park. I had found the old letters at the garage sale of an antique dealer on my trip to Maine earlier in the summer and brought them with for my late September trip. In terms of image processing, this is pretty much a "straight" image. The raw file was processed in Photoshop Lightroom and some minor edge burning was applied via a Curves adjustment layer in Photoshop. I was photographing the letters as subjects for some pinhole photographs using my ZeroImage 6x9 camera. Since this camera has a very wide field of view, I realized when I was setting it up on the tripod facing straight down at the letters on the ground, that it was very likely that the front tripod legs would be in the shot. Of course, I could have just made the photos anyway and then retouched the tripod legs in Photoshop, but I am a bit of a purist where my pinhole images are concerned and since I print these full frame with no cropping and showing the actual edges of the negative, I really didn't want to have to retouch the tripod legs if I could figure another way of working the problem. The old mantra again: get it as right as possible in the camera and that means there's less work to do in Photoshop. Fortunately, I had a special flexible tripod with me that I had purchased earlier in the spring but had not yet used. The Joby Gorillapod is a very cool design with bendable segmented legs that allow you to wrap them around other objects and mount the camera in all sorts of otherwise tricky locations such as tree limbs, fence posts, etc. I mounted the pinhole camera to the Gorillapod and then molded it's flexible legs around a Bogen Super Clamp which I had mounted on the head my tripod. The Super Clamp was used to create additional extension as well as to provide more surface area to wrap the Gorillapods legs around. The combination of the Gorillapod and the SuperClamp provided enough forward extension so that the camera could be pointed straight down at the still life setup without the tripod legs showing in the shot. Fortunately, the wooden pinhole camera is very lightweight and is easily supported by the Gorillapod. The model that I purchased can support 1.75 lbs (800g). They have a more robust version designed for heavier SLRs with zoom lenses that will support 6.6 lbs (3 kg) Below are a couple of photos showing the setup in action. The ZeroImage pinhole camera mounted on the Gorillapod, which in turn is attached to a Bogen Super Clamp mounted to the tripod head. I'll try and scan one of the pinhole negatives of this scene this week and post that either towards the end of this week or early next week. Seen in the window display (and I am being very generous here with the term "display") of a pharmacy on Paradise Ave. I just got back from the Photoshop World conference in Las Vegas this weekend. A whirlwind three days of all things Photoshop. It was good to meet up with friends and colleagues that I only see at these events. Las Vegas was, well...Las Vegas. Definitely a strange place. This was my fourth trip here in a year. I can't say that I would choose to go here if I did not have a conference to go to, but there's always something interesting to photograph. We interrupt our program of New Mexico images to bring you some Diana camera photographs from Maine. More New Mexico scenes are scheduled for next week. Places like this are so perfect for toy cameras. Another photographic homage to old Las Vegas motel signs. I was in Vegas for a couple of days last week to give a presentation at the PMA (Photo Marketing Association) convention and trade show. This was taken on my last day there when I decided to skip a taxi ride and walk from my hotel to the convention center. It was warm, but not too hot, and there was a comfortable breeze blowing. Although the cab ride would have been faster (the walk took about 45 minutes), weather, time and distance permitting, I think that walking is always better. Not only for the health aspects of getting out and moving around, but also for the photographic opportunities you find that you would miss if you were in a car. This place was discovered on that walk: a 1950's era motel in the midst of the current mega hotels and casinos that populate the strip. This was actually located just off the strip on Convention Center Drive, but it was still an anachronism in its current surroundings. When photography is an integral part of your life, as it is in my life, you make images all the time. On "normal" days (whatever that means), happy days and sad days. Not every image you make may be "good" or significant, but the act of looking through the viewfinder and seeing becomes a process that is part of the fabric of who you are. This is certainly the case with me. I make images to see and remember the world around me, and also to better understand myself. Some of my images are "finished" the moment my finger presses the shutter button, while others are more like the notes that a writer might make; upon revisiting those visual notes, they might become something more, a finished image or even a part of a series, or they may remain as stray notations of things seen and moments recorded. 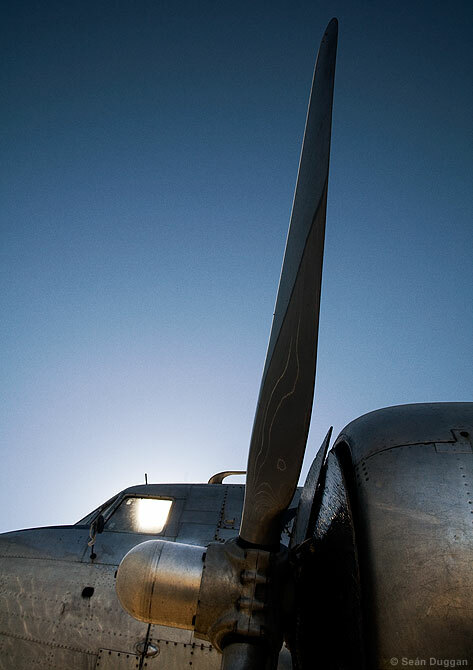 This photograph shows an engine vent under the wing of a vintage DC-3 airplane. I had seen this old, slightly decrepit plane parked by the side of a hangar next to the freeway in California's dry central valley several times in the past two months as I drove back and forth to my brother's house to help care for my father, who was slowly dying of cancer. Every time I drove by I made a mental note of the location in the hope that I would be able to find the time to stop and photograph it one day. But there was never any time; I was always rushing back and forth between my house and my brother's house, or airports or other workshop locations where I was teaching. I finally found the time to photograph it one afternoon in late July. My father had died early that morning in the still hours of the night, a blessfully peaceful and quiet passing that was a profound experience to witness. On my drive home that hot summer afternoon, I stopped here to lose myself in the camera and the viewfinder, sorrow pushed aside for a short while in the act of seeing and making images, that familiar ritual that is so much a part of my life. And there under the wing, in the vent of one of the engines of the old plane, I found this bird's nest with five little eggs. On any day, it would have been a beautiful thing to find, but on that day, when I had watched my father take his last breath not 12 hours before, it was an especially welcome and poignant sight. A closed-up roadside restaurant in coastal Maine. See the previous post for another image from this location. I also took some Holga and pinhole shots there but have not had the chance to scan those negs yet. I feel this is fitting for the first post of the new year since a weathervane conjures up ideas of determining how the wind is blowing, finding the right direction and setting a course for the journey ahead. The ship is symbolic of a voyage into the unknown (and what greater unknown than the future), while the house represents the safe harbor of home and family. This was taken last fall during my sojourn through New England; found in a group of oversized nautical lawn totems at a closed-up roadside restaurant. There was also a giant lobster trap and wooden fish skeleton. The main restaurant building had the faux stern section of an old sailing ship protruding from one side (that will be tomorrow's post).